A glorious sunset over a campfire on the shores of scenic Nimpkish Lake on Northern Vancouver Island, heralds the end of a beautiful summer day. 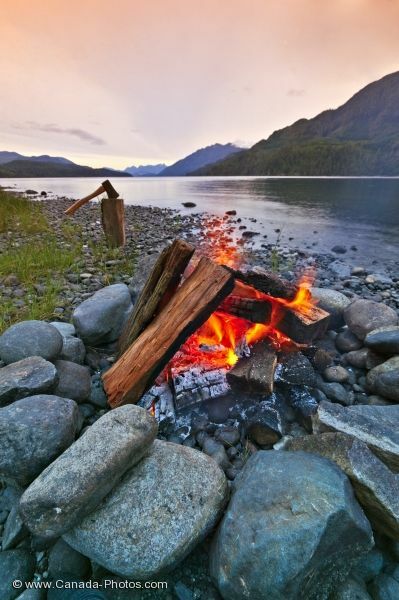 Embers glow in a campfire contained by a ring of rocks on the shores of Nimpkish Lake as the sunset lights the evening sky and the scenic mountains in the background. Camping with camp fire at Nimpkish Lake on Northern Vancouver Island near Port McNeill, British Columbia, Canada. Please let me show you more of my pictures from my "photo gallery: Vancouver Island Photos". Pictures from photo gallery "Vancouver Island Photos"